One of life’s reminders that God is both Sovereign and Creator. 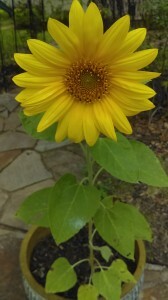 This random sunflower sprouted this Spring in one of our empty random pots. It has become one of our family favorites, and it reminds us that Father will do what he wills to do in his perfect timing. This pot was willing and ready to receive it! The work is not finished, though. When God created this lovely friend a few weeks ago, he had a plan for it. 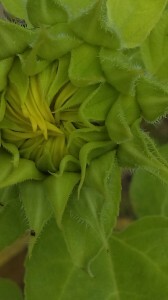 Did you know that a sunflower is heliotropic? One of its coolest attributes is that it orients itself to the sun…all of the time. Its scientific name, Helianthus, means that it is the “flower of the sun.” From the sunrise in the east to the sunset in the west, it follows the sun. It was created by God to seek and find him, point its face to him, reflect his beauty, and to bask in his glory. Does this sound familiar? “Has anyone by fussing in front of the mirror ever gotten taller by so much as an inch? All this time and money wasted on fashion [corporate positioning, youth sports, appearance, or house address] – do you think it makes that much difference? Instead of looking to these things, walk out into the fields and look at the wildflowers. They never primp or shop, but have you ever seen color and design quite like it? The ten best-dressed men and women in the country look shabby alongside them. May this be my nature, to follow the Light, my Savior, my Provider, my Lord and my Comfort; to enjoy him, be at peace with others, and bask in his glory and delight.